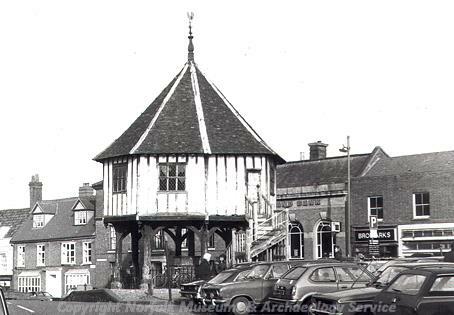 The Market Cross is a timber-framed structure erected in 1617-1618 following the destruction of its predecessor in 1615. The building itself consists of an octagonal building supported over an open ground floor by eight timber buttress-like posts and a middle post. The is a little carved decoration on the upper floor, which is reached by an outer stair from the back, and the building is crowned by a pyramidal roof. The building now houses the Tourist Information Centre. Built around 1617 on site of medieval cross. Detailed description in file (S1). Compiled by E. Rose (NLA) 25 June 1990. --- Aerial Photograph: Edwards, D.A. (NLA). 1996. TG 1101W - Z. --- Publication: Mossby and Agar. 1949. Wymondham Old and New. --- Newspaper Article: Eastern Daily Press. 2010. Arsonists in bid to burn iconic cross. 29 April. --- Archive: Clarke, R. R. and NCM Staff. 1933-1973. Norwich Castle Museum Record Card - Post-Medieval. Wymondham. <S1> Unpublished document: Rose, E.. 1990. Building Report.